Thursday 17 December 2015 – Seven distinguished churches and a cathedral are to have urgent and essential repairs carried out thanks to a funding package announced today by the Heritage Lottery Fund (HLF) and Historic Environment Scotland (HES). From a church modelled on the hull of a boat to the first cathedral to be built in the UK after the reformation, over £1.55million of funding will ensure that these fine buildings are once again wind and watertight providing a venue for worship and a hub for community activity. The funding will also be used to explore the fascinating history of many of the churches which will be shared with the community and visitors through events, publications and digital media. Many will train volunteers to give guided tours. 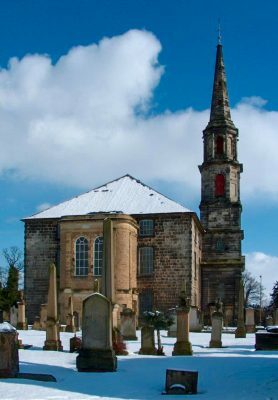 Receiving a grant today is St Michael’s Church in Inveresk. It is known as ‘the Visible Kirk’ as its graceful spire, which can be seen for miles around, was used as a navigational fix by ships in the Firth of Forth. The fishing heritage of Dunbar is reflected in St Anne’s Church which also received an award. Its roof interior is modelled on the hull of a boat. Four churches, including the seat of Episcopalian worship in Edinburgh, are to be repaired thanks to a funding package announced today by the Heritage Lottery Fund. With three in Edinburgh and one in Ayrshire, each is of important architectural merit but in desperate need of repair. Situated between two medieval closes in Jeffrey Street, Edinburgh, Old St Paul’s stands on the site of the original home of Episcopalian worship in the city. People have worshipped there since 1689 when a breakaway group from the Old Cathedral of St Giles, led by Bishop Alexander Rose, left the Cathedral after refusing to renounce on oath James VII and II, following the joint accession of William and Mary and the re-establishment of Presbyterianism in Scotland. Instead the Bishop and much of his flock found a new place of worship in an old wool store in Carrubber’s Close (this stood on the present site of Old Saint Paul’s) where they remained staunchly Jacobite, loyal to James and his descendants. Designed in 1880 by Hay and Henderson, Old St Paul’s is a fascinating architectural gem as, situated between two narrow, steep closes, only its main chancel end with three simple windows are visible from Jeffrey Street resulting in a magical ‘tardis’ effect when entering the church. The building is used regularly for worship as well as a venue for the Edinburgh Festival and choral and orchestral concerts. The Heritage Lottery funding has been earmarked for urgent roof, masonry and window repairs. 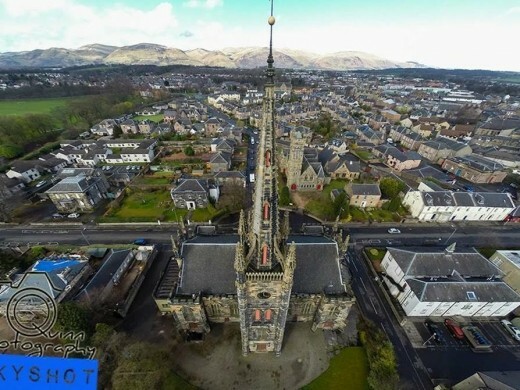 A prominent feature in the village of Crosshouse and a venue for many community gatherings, the Parish Church was built in 1882 by Bruce Sturrock & Co. Last year, however, the four pinnacles which completed its 60ft tower had to be removed as they had become insecure and posed a serious risk to public safety. The incomplete tower still remains unstable and in urgent need of repair. Today HLF gave the church the green light for a project to carry out those repairs and reinstate the four pinnacles. Corstorphine Old Parish Church was originally built in the 1429 and started life as a modest family burial chapel for Adam Forrester, a burgess and provost of Edinburgh who was knighted for his services. As the population of Corstorphine grew the Church was remodelled and extended many times, most significantly by William Burn in 1828 who re-orientated the church internally. Today the building retains much of its pre-Reformation character. It has a distinctive low tower and on the east gable is a niche which held a light used to guide people through the marshland which once existed between Corstorphine and Edinburgh. However, perhaps its most notable feature is the chancel’s roof of heavy stone slabs. This is in need of urgent repair as 11 of these slabs slid off the roof last year and although temporarily safe require additional work. Urgent repairs to the stained glass windows will also be undertaken. Sitting adjacent to the Union Canal, Polwarth Parish Church is the cornerstone of local activity. Dancing classes, toddlers, fitness classes, neighbourhood watch, community council, youth club, choir club as well as regular worshippers see the church as an integral part of community life. Designed in 1899 by Sydney Mitchell & Wilson, it was originally built as the Candlish Memorial Free Church and completed in 1913. It is now in poor condition and requires urgent repair works to the roof, windows and masonry. A ‘Stage One Pass’ means that money has been earmarked by the Heritage Lottery Fund for the project in question. Competition at this stage is tough, and while a Stage One Pass does not guarantee funding, it is an indication of positive support, and money for the scheme is set aside. The applicant can then progress to Stage Two and submit a further, fully developed application to secure the full grant. On occasion, at Stage One, funding will also be awarded towards the development of the scheme. 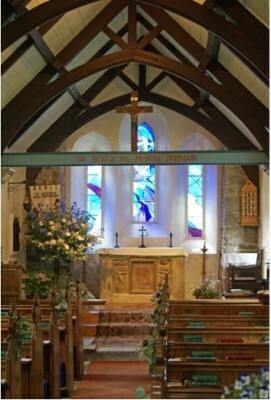 The Heritage Lottery Fund and Historic Scotland established the joint Places of Worship Scheme in October 2002. To date the Heritage Lottery Fund has awarded over £40million to places of worship in Scotland. The Heritage Lottery Fund (HLF) enables communities to celebrate, look after and learn more about our diverse heritage. From our great museums and historic buildings to local parks and beauty spots or recording and celebrating traditions, customs and history, HLF grants open up our nation’s heritage for everyone to enjoy. To date it has invested over £450million in Scotland’s heritage. December 12, 2015 in Scotland.